In this guest article by David Tomlinson, he explains why when it comes to paint that more expensive doesn’t necessarily mean better and that cheap doesn’t necessarily mean value, and also looks at different brushes, explaining some of the terms used with references to brushes. This will be of particular help to anyone who may wish to avoid using brushes with animal hair, including many vegans. Below are three types of paint I have purchased for painting miniatures. The left hand bottle is a 59ml bottle of white acrylic for £1.00, the middle is a 17 ml dropper-bottle of Vallejo acrylic paint for £2.45, and the third is a 12 ml pot of Citadel acrylic for £2.55. Now mathematically the 59ml of cheap craft paint is much cheaper at 1.69p per ml, as opposed to 14p per ml for Vallejo and 21.25p per ml for Citadel, but in reality I think it offers the least value to a miniature painter. 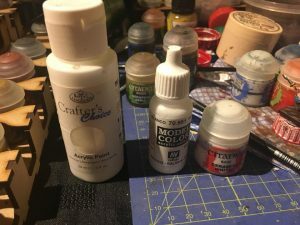 The craft paint is a cheap formula which is made for people painting onto canvas, whereas the other two paints are specifically formulated for painting miniatures. The main differences are that the craft paint is very thick, and while you have to thin any of these paints, the craft paint will need an awful lot of thinning to be useful, and it will not give you as good a finish as it was not designed for miniatures. When painting minis you rarely use more than a drop or two of paint, so the craft paint also gives you far more paint than you should need. For example since I purchased the Vallejo paint I have painted over 200 miniatures and have used white on each one (sometimes just to mix to make a shade), and yet the bottle is only about half-empty, so why would I need 59ml as I wouldn’t use that over a course of years (and the larger bottle is a pain to store). The citadel paint has a terribly designed tub that wastes paint, and unlike Vallejo you can’t just get a measured amount without some degree of extra paint being used. The tubs tends to clog at the edges and needs occasional scraping, and the paint tend to clump meaning it needs a lot of mixing before you can use it. Citadel paints are very good quality on the whole, but their white paint is not my favourite. In summary, cheap is not always best, nor is expensive always best. Consider if the price is worth the sacrifice of paint quality. A well formulated paint in a dropper bottle will give you a quality paint with a minimum of waste, and should last you for hundreds of Mini’s. For those who follow a Vegan lifestyle, that choice of brushes and art materials is a much more difficult choice, and I wanted to discuss that aspect. I am not a vegan and I apologise if I make any errors or assumptions. I also don’t want to suggest that those who are not vegan would not object to using animal products, but I felt the Vegan ethic was widely enough known for people to identify if they would have similar issues. I would ask those that wish to comment to respect people’s ethical choices and any comments mocking or deriding people may be deleted without warning. This is also not a platform to preach about the pros and cons of veganism. The problem for those who are vegan, or have similar positions on animal products is that when it comes to brush selection. The majority of brushes for miniature painters will contain animal hair, and even some brushes labelled as synthetic can sometimes contain some animal hair when you check the small print. Synthetic: artificially made fibers. The difficulty with synthetics is that they, as yet, do not match the higher quality Kolinsky brushes. There’s a wide variety of quality from cheap nylon brushes up to white sable brushes. Sable: typically these are actually brushes made from animal hair, but are rarely hairs from the animal known as a sable. These will more usually be other animals such as martens or minks. Kolinsky Sable: These hairs are actually from the tails of Siberian weasels, found in the Kolinsky region, which are trapped and killed for various products, including brushes. They are highly prized by painters as the hair is considered the finest for the use in brushes due to its spring and ability to form a precise point. Red Sable: These hairs are also weasel hair, but not from the Kolinsky region of Siberia. White sable: These are a synthetic brush hair. Golden sable: another name for synthetic hair, though the term gold can also used used in natural/synthetic blends. Always check the specifics of the contents of the brush. Other animal hair used in brushes include horses, pig and squirrel. One other type of product to be watchful for are brush soaps as these can be tallow based. Given that absentmindedly licking a brush while painting is common this could also be an issue for vegetarians. There are many good brush cleaners that are not tallow based, but as the manufacturers don’t always list ingredients it can be difficult to be certain. B&J ‘The masters’ is one of the more popular brush cleaners but I believe that does contain tallow. The real challenge for Vegans is that synthetic hairs still aren’t a substitute for the high quality hair such as Kolinsky sable, and as such you may struggle to find a brush that gives you the same performance. This does not mean that you cannot find a high performance brush that will suit your purposes, nor other suitable painting products, and in researching this I found several articles and forums discussing suitable choices for vegans. If you are vegan, or simply do not wish to use animal products, then a bit of internet research should help you find suitable products. I don’t know if this is useful to people, but that given the term ‘sable’ is used for a wide variety of hairs, I hope this helps inform people that it’s worth doing a bit of research online as animal products are so common in painting. Many thanks to David Tomlinson for this informative article.